Browse these articles about recent disasters. Events are changing rapidly and while we do my best to keep up and post some of the latest disaster news, we can not read everything, so if you happen across something that you would like us to include, please send us an email and we will get it posted. Ranchers in South Dakota fear they may lose everything after a freak storm dumped up four feet of snow in parts of the state last week, killing as many as 100,000 cattle. Carcasses of mature cows as well as calves were floating downstream local waterways in droves, Kammerer said, stoking fears of a potential outbreak of disease. Read more. At least 37 patients are in a critical or serious condition in hospitals, according to Shaanxi provincial government. Victims of the attack have been left with deep, dark craters in their skin the size of bullet wounds. One victim told local media that 'the more you run, the more they want to chase you' and some victims described being chased about 200 metres (656 feet) by the deadly insects. Read more and see photos. The National Weather Service in Omaha says the Friday night tornado that destroyed homes and businesses in northeast Nebraska was a powerful EF4 in places, with winds reaching 170 miles per hour. The weather service, in a preliminary damage survey, said Saturday night the tornado at one time was 1.38 miles wide and was on the ground for a total of 19 miles. The tornado became about a-mile-and-quarter wide as it severely damaged another farmstead and caused EF3 damage to two homes along Highway 15 just south of Wayne. The tornado missed the downtown and residential districts, and severely damaged the softball complex on the southeast side of Wayne. Read more. ROME (AP) — A ship carrying African migrants to Europe caught fire and capsized off the Italian island of Lampedusa on Thursday, killing at least 94 people as it spilled hundreds of passengers into the sea, officials said. Over 150 people were rescued but some 200 others were still unaccounted for. It was one of the deadliest accidents in the notoriously perilous Mediterranean Sea crossing from Africa for migrants seeking a new life in the European Union. "It's an immense tragedy," said Lampedusa Mayor Giusi Nicolini. Read more. Islamabad : At least 371 people were killed and over 750 others injured after two earthquakes hit Pakistan's southwest Balochistan province within a period of three days, officials said. Talking to Xinhua, Saif-ur-Rehman, spokesperson of Provincial Disaster Management Authority said that a total of 359 people were killed and 750 others injured in the 7.7-magnitude earthquake that hit the province Thursday, while the second earthquake measuring 7.2 at the Richter scale, which struck the area Saturday afternoon, killed 12 people. He said that the earthquakes played havoc in Awaran district as it was the epicentre of both earthquakes. He said that Thursday's quake affected six districts with Awaran being the worst hit, where 312 people were killed and 525 others injured when thousands of houses collapsed in various towns and villages of the district. Read more. JAKARTA, Sept 15 — Thousands of villagers fled yesterday after a volcano erupted on Indonesia’s Sumatra island spewing rocks and red-hot ash onto surrounding villages, officials said. Mount Sinabung in Karo district, North Sumatra province, erupted violently before dawn. “More than 3,000 people have been evacuated from areas within a three-kilometre radius of the volcano, and they are all safe,” Asren Nasution, the head of North Sumatra disaster agency, told AFP. Five halls normally used for traditional cultural ceremonies had been converted into shelters for those displaced. Sutopo Purwo Nugroho, national disaster agency spokesman, said 3,710 people had so far been evacuated. Read more. State emergency officials reported more than 1,200 people total had not been heard from, but that number already was dropping Monday as Larimer County said it had made contact with hundreds of people previously unaccounted for. With rescuers reaching more pockets of stranded residents and phone service being restored in some areas, officials expect that number will continue to decrease. "You're got to remember, a lot of these folks lost cellphones, landlines, the Internet four to five days ago," Gov. John Hickenlooper said on NBC's "Today" show. "I am very hopeful that the vast majority of these people are safe and sound." Read more. DENVER -- Four days of rain have turned parts of Colorado into a flash-flood zone as rising waters have brought death, destruction and mudslides, forcing evacuations and shuttering schools. 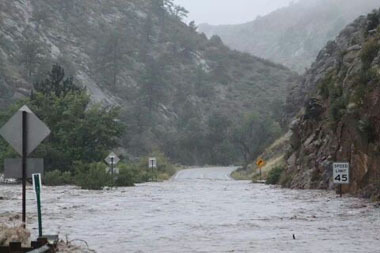 At least three deaths have been confirmed, officials said Thursday, as search-and-rescue teams were trying to reach stranded residents and motorists in Boulder and nearby mountain communities and heavy rains continued. “The city of Boulder is just overwhelmed with water,” Barbara Halpin, a spokeswoman for the Boulder Office of Emergency Management, told The Times. “I've heard from people who say they have lived here for 25 years and have never seen anything like it.” Read more. Evacuations are currently being conducted throughout Estes Park, mostly the elderly. It is not known where those people are being taken. Several residences were evacuated over night along Fish Creek near Brook Drive. Larimer County notified nearly 600 residents in the Big Thompson Canyon shortly before 8 a.m. today that water is being let out of Olympus Dam from Lake Estes. As a result, the level of the Big Thompson River is expected to rise significantly. Estes Park Public Information Officer Kate Rusch said today that all rivers and streams in the area - especially Fall River, Fish Creek, and the Big Thompson River, are out of their banks. She said residents should exercise extreme caution if they need to leave their homes. Read more. A volcano erupted in eastern Indonesia on Saturday that killed six people, USA TODAY reported. Three thousand people were evacuated after Mount Rokatenda erupted in East Nusa Tenggara province, filling the beach village on the island of Palue with burning hot lava and swelling the air with smoke and ash that reportedy reached 2,000 meters into the air, according to an official. Read More. Locals living in the shadow of Sakurajima [Volcano in Japan] have been urged to cover up and wear masks as a health and safety measure, but there are no immediate reports of injuries. Volcanologists believe the mountain may spew out more ash this year than in the previous two decades. Masato Iguchi, a professor at the Sakurajima Volcano Research Center, said 2012 saw a record number of eruptions. Kyoto University’s disaster reduction research institute keeps close tabs on the volcano in order to avoid a repeat of its 1914 eruption, in which 58 people died. That episode was the most powerful volcanic eruption to hit Japan in a hundred years. At present, Sakurajima erupts on a small scale several thousand times a year, sending ash a few kilometres above its peak. Read more and view amazing photos! Chinese state media say emergency personnel have rushed to reach a northwestern region hit by a strong earthquake that killed at least 89 people, but landslides are hampering the disaster response. The U.S. Geological Survey said the shallow, magnitude 5.9 quake struck early Monday, near the city of Dingxi in mountainous Gansu province. It said a second tremor measuring 5.6 shook the area about 90 minutes later, while hundreds of aftershocks followed. Read more. People are starting to fear for their health in India as corpses begin to decay and contaminate water sources following the devastating floods which is now two weeks old. Some of the victims have reported suffering from diarrhea. Officials fear an outbreak of pandemic diseases such as cholera and dysentery could erupt anytime. "We are getting reports from the field (in Rudraprayag, one of the worst affected districts) that there are rotting bodies lying around, many of them semi-buried in soil and rubble that came down from the mountains," Zubin Zaman, humanitarian manager for Oxfam India, was quoted by Reuters. The air in India has started to smell bad. "Under no circumstances can we allow an outbreak of an epidemic," KN Pandey, a senior disaster management official, told AFP. Read more. Mass cremations are taking place in the Indian state of Uttarakhand, where more than 800 people died after recent floods and landslides. Efforts are continuing to evacuate around 3000 people still stranded in the Himalayas. Watch Video. Recent severe floods in northern India have claimed at least 822 lives while efforts to rescue thousands of stranded survivors have been made increasingly difficult because of the ongoing bad weather. Throughout the week, rescue missions have been repeatedly grounded due to heavy rains and fog and on Tuesday a rescue helicopter crashed during a medical mission, killing all 20 people on board. Read more. COLORADO SPRINGS, Colo. (AP) — A wildfire fueled by hot temperatures, gusty winds and thick, bone-dry forests has destroyed 92 homes, damaged five more and prompted more than 7,000 residents northeast of Colorado Springs to flee, sheriff's official said Wednesday. A separate Colorado wildfire to the south has destroyed 20 structures and prompted evacuations of about 250 residents and nearly 1,000 inmates at medium-security prison. To the north, another fire burned in Rocky Mountain National Park. Wildfires also were burning in New Mexico, Oregon and California, where a smokejumper was killed fighting one of dozens of lightning-sparked fires. Read more. At least 11 people are dead and more than 100 are recovering from their injuries after another violent outbreak of tornadoes in central Oklahoma Friday evening. The Oklahoman reported two of the dead are children, according to the Oklahoma City Medical Examiner with 104 others injured. Among the 11 dead were a mother and a baby found in a vehicle that was tossed several times by a tornado. Two others died in flood waters after record rainfall Friday evening. Read more and watch video. Friday evening’s twisters killed at least nine people, two of them children, and injured scores more in Oklahoma, the office of the city’s medical examiner said. Five victims had not been identified. Read more. MOORE, Okla. — A monstrous tornado as much as a mile wide with winds exceeding 200 mph roared through the Oklahoma City suburbs Monday, flattening entire neighborhoods, setting buildings on fire and landing a direct blow on an elementary school. The storm laid waste to scores of buildings in Moore, south of the city. Block after block of the community lay in ruins, with heaps of debris piled up where homes used to be. Cars and trucks were left crumpled on the roadside. The National Weather Service issued an initial finding that the tornado was an EF4 on the enhanced Fujita scale, but later found evidence of EF5-level damage, making it the strongest tornado in the United States since an EF5 tornado hit El Reno, Okla. on May 24, 2011. Read more and see photos. Three people were killed and hundreds were rescued after an historic rainfall event over the weekend sent severe floods through the streets of San Antonio, Texas. The National Weather Service (NWS) reported 12.20 inches of rainfall drenched the city from Friday into Saturday (May 24-25) with 9.87 inches of that coming Saturday morning alone. The 9.87 inches of rainfall was the second highest daily amount ever on record to fall in the city, according to the NWS. 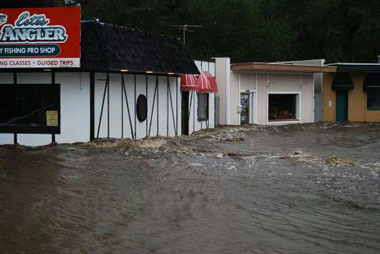 The result of the record rainfall, widespread floods that inundated roads, highways, homes and businesses. Read more and watch video. A devastating, mile-wide tornado touched down near Oklahoma City on Monday, killing at least 51 people and decimating homes, businesses and a pair of elementary schools in the suburb of Moore. According to the state's medical examiner, the death toll was expected to rise. The schools—Plaza Towers Elementary and Briarwood Elementary—were leveled by the tornado. It was unclear how many children were in them at the time the twister hit, but according to KFOR, at least seven children died at Plaza Towers, and as many as two dozen more were feared to be trapped inside the rubble. An Associated Press photographer saw rescue workers pull several children out alive. A makeshift triage center was set up in the school's parking lot. Read more. Storm chaser and IMAX film maker Sean Casey and his team captured what is arguably the most extraordinary video taken from inside a tornado ever. From inside the relative safety of their Tornado Intercept Vehicle (TIV), the team was able to enter a monstrous wedge tornado near Smith Center, Kansas yesterday. Read more and watch video. A significant rash of tornadoes have been confirmed in a violent outbreak across northern Texas Wednesday evening that left a half-dozen dead and many others injured. While damage surveys continue, the National Weather Service (NWS) reported Thursday (May 16) that at least 16 tornadoes hit nine counties including Montague, Wise, Parker, Hood, Johnson, Mills, Hamilton, Palo Pinto and Ellis. Several counties were found to have been hit by multiple tornadoes including Parker and Montague with three each and Johnson and Hood with two each. The powerful and violent EF-4 tornado tore a half-mile-wide and 2.5-mile long path of destruction through the town of Granbury in Hood County. Read more. LAKEPORT, Calif.—Scott and Robin Spivey had a sinking feeling that something was wrong with their home when cracks began snaking across their walls in March. The cracks soon turned into gaping fractures, and within two weeks their 600-square-foot garage broke from the house and the entire property—manicured lawn and all—dropped 10 feet below the street. It wasn't long before the houses on both sides collapsed as the ground gave way in the Spivey's neighborhood in Lake County, about 100 miles north of San Francisco. "We want to know what is going on here," said Scott Spivey, a former city building inspector who lived in his four-bedroom, Tudor-style dream home for 11 years. Eight homes are now abandoned and 10 more are under notice of imminent evacuation as a hilltop with sweeping vistas of Clear Lake and the Mount Konocti volcano swallows the subdivision built 30 years ago. Read more. Philippine disaster officials say the bodies of four Europeans and their Filipino guide who were killed by rocks in a volcanic eruption early this week have been brought down from Mount Mayon. Albay provincial disaster officer Jukes Nunez says soldiers in a helicopter on Thursday carried the body of Filipino Jerome Berin, followed by the remains of the four Europeans. Read more. The China Earthquake Administration said at least 160 people had died, and more than 6,700 were injured. At least 96 people were killed in Lushan, and in the jurisdiction of Ya'an, which administers Lushan, 19 people were reported missing, the administration said. The quake - measured by the earthquake administration at magnitude-7.0 and by the U.S. Geological Survey at 6.6 - struck the steep hills of Lushan county shortly after 8 a.m., when many people were at home, sleeping or having breakfast. The quake's shallow depth, less than 13 kilometers (8 miles), likely magnified the impact. Lushan, 115 kilometers (70 miles) west of the provincial capital of Chengdu, reported the most deaths, but there was concern that casualties in neighboring Baoxing county might have been under-reported because roads were blocked and power and phone services cut off. Read more. A massive explosion at a fertilizer plant near Waco on Wednesday injured dozens of people and killed an unknown number of others, leaving the factory a smoldering ruin and leveling buildings for blocks in every direction. The explosion at West Fertilizer in the town of West happened shortly before 8 p.m. local time and could be heard as far as 45 miles away. It sent flames shooting high into the night sky, and rained burning embers, shrapnel and debris down on shocked and frightened residents. Although authorities said it will be some time before they know the full extent of the loss of life, Texas Department of Public Safety spokesman D.L. Wilson said just after midnight that an unknown number of people had died. Link no longer available. Crashing continents caused today's (April 9) deadly earthquake in Iran, which killed dozens, according to news reports. The magnitude-6.3 Iran earthquake hit in the southern Zagros Mountains, a stunning range that marks the boundary between the Arabian and Eurasian tectonic plates, said Bill Barnhart, a research geophysicist at the U.S. Geological Survey's (USGS) Denver office. The Arabian plate is grinding northward at about 0.4 inches (10 millimeters) a year, pushing the boot-shaped Arabian peninsula into the Eurasian plate, which covers most of Europe and Asia. The magnitude-6.3 earthquake was not unusual for southwestern Iran. Thanks to the region's long historical record, scientists know temblors along the plate boundary typically range from magnitude 5.5 to 6.3, Barnhart said. And small earthquakes ranging from magnitude 4 to magnitude 5 frequently shake the region. "Earthquakes are very, very common here," he said. In 2003, some 26,000 people were killed by a 6.6 magnitude quake that flattened Bam, located about 400 miles (650 km) east of today's earthquake. The Bam earthquake was a strike-slip, meaning the ground on either side of the faults moved mostly horizontally, as California's San Andreas fault does. Read full article. A manmade disaster was made even worse by nature Wednesday night, as a severe thunderstorm hit Mayflower, Arkansas spreading the Exxon Mobil oil spill to the yards of homes along the cove and the main body of Lake Conway. For nearly two weeks, Exxon has maintained that oil has not reached Lake Conway, despite clear evidence both from aerial video and on-the-ground guerrilla reporting that showed oil had spread throughout a cove and wetlands, which are connected through ground water and drainage culverts to the main body of the lake. Images captured Wednesday night should put any doubt to rest that the main body of Lake Conway is now contaminated with oil. Read full article. The underground pipeline, owned by ExxonMobil, sent at least 147,000 gallons of heavy Canadian crude oil through the streets of one of the town’s more affluent neighborhoods, forcing the evacuation of 22 homes. A smell that residents describe as “acrid” or “like burning tires” still lingers in the North Woods subdivision. Read full article. At least 24 people died and more than 100 were injured after heavy rain moved through five provinces and a "super-tornado" carrying huge hailstones hit one city. The China Meteorological Centre says the severe weather is expected to continue until Sunday. Continue Reading. ...she places them carefully in a small round straw basket and within a few minutes, she has collected dozens of insects. This is Borikely's only meal of the day, revealing the extent of the food crisis that has gripped the Indian Ocean island since cyclone Haruna hit three weeks ago. "I don't like grasshoppers, but I am forced to eat them since the cyclone because I am hungry," Borikely told AFP. The storm killed 26 people and affected nearly 40,000 more, devastating several villages and forcing thousands of people to cram into emergency camps. Now, villagers like Borikely fill their stomachs by eating grasshoppers which are cooked with a little salt and water, or grilled in some parts of the country. Read More. 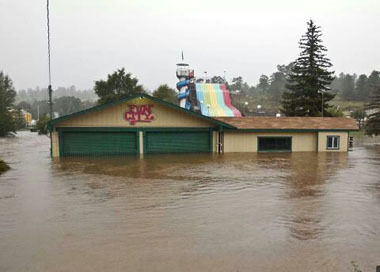 An unprecedented rainstorm caused widespread flooding on Friday and led to the death of a 28-year-old female motorist. The woman was found slumped over the steering wheel of her car which had stalled on a flooded road on the border of Halandri and Maroussi. She was transferred to hospital where doctors confirmed her death, apparently from a heart attack. The rainfall, which started in the early hours of the morning, flooded several roads with the areas of Aegaleo, Nikaia, Haidari and Peristeri in the western suburbs among the worst hit. A derelict building in the rundown central district of Aghios Panteleimonas collapsed, apparently due to the heavy rain, but there were no injuries. The fire service received more than 400 calls to pump out flooded basements or rescue stranded vehicles. Read more. A meteorite exploded over central Russia on Friday, injuring some 1,000 and leaving many buildings badly damaged. As authorities work to treat the victims and repair the damage, people who witnessed the explosion have uploaded video and photos to the Web. No fatalities have been reported. Click here to view amazing footage of the blast. A professional photographer today told of the moment he feared a nuclear bomb had gone off when the Russian meteorite tore through the sky as he took pictures of an idyllic rural scene. Marat Akhmetaleyev, 31, had just set up his tripod when the space rock lit up the crisp, morning sky almost where his camera was pointing. Despite trembling with shock, he instinctively started to snap away. Click here to see his amazing photos. The tornado that tore through Hattiesburg, Miss., on Sunday—damaging buildings in and around the University of Southern Mississippi, and injuring at least 10 people—was caught on video by witnesses in the area. Follow link to view video. New Englanders began the back-breaking job of digging out from as much as 3 feet of wet, heavy snow Saturday and emergency crews used snowmobiles to reach shivering motorists stranded overnight on New York's Long Island after a howling storm swept through the Northeast. About 650,000 homes and businesses were left without electricity, and some could be cold and dark for days. Many roads across the New York-to-Boston corridor of 25 million people were impassable. Cars were entombed by drifts. And some homeowners woke up in the morning to find the snow packed so high they couldn't get their doors open. Read more. A powerful 8.0 magnitude earthquake set off a tsunami that killed at least five people in a remote part of the Solomon Islands on Wednesday and triggered evacuations across the South Pacific as island nations issued tsunami alerts. The quake struck 340 km (211 miles) east of Kira Kira in the Solomons, the Pacific Tsunami Warning Center in Hawaii said as it issued warnings for the Solomons and other South Pacific nations including Australia and New Zealand. It later canceled the warnings for the outlying regions. Read more. BRASILIA, Brazil (AP) — A blaze raced through a crowded nightclub in southern Brazil early Sunday, killing 232 people as the air filled with deadly smoke and panicked party-goers stampeded toward the exits, police and witnesses said. It appeared to be the world's deadliest nightclub fire in more than a decade. Witnesses said that a flare or firework lit by band members may have started the fire. Police Maj. Cleberson Braida Bastianello said by telephone that officials counted 232 bodies that had been brought for identification to a gymnasium in the city of Santa Maria, at the southern tip of Brazil near the borders with Argentina and Uruguay. Read more. DHAKA, Bangladesh (AP) — Bangladesh's government has ordered an investigation into allegations that the sole emergency exit was locked at a garment factory where a fire killed seven female workers, an official said Sunday. The fire Saturday at the Smart Export Garment Ltd. factory occurred just two months after a blaze killed 112 workers in another factory near the capital, raising questions about safety in Bangladesh's garment industry, which exports clothes to leading Western retailers. The gates of that factory were locked. Government official Jahangir Kabir Nanak said an investigation has been ordered into the cause of Saturday's fire and allegations that the emergency exit was locked. Read more. Severe weather is pummeling the Middle East. Latest reports puts the death toll at dozens. Bad weather’s no stranger to those places, but the Mid East dressed up in alpine weather? Surreal. Early this week, the Greater Amman Municipality announced a moderate state of emergency in the capital to deal with predicted severe weather conditions. Yesterday, the Prime Minister issued a directive closing all government and public offices; most schools had already issued pre-emptive shut-downs. Read more. Israel and the Palestinian territories continue to be lashed by heavy rains and winds, causing at least six injuries and downing power lines across the region. Winds reached 74 miles an hour, according to Israeli military radio, and trees surrounding the Temple Mount/Haram al-Sharif complex that houses the Dome of the Rock and Al-Aqsa mosques were torn from the ground, Agence France Presse reported. Read more. LAGOS, Nigeria – A massive fire tore through a waterfront slum in Nigeria's megacity of Lagos on Tuesday, burning down dozens of shack workshops and homes. When firefighters didn't turn up, locals tried in vain to stop the blaze with buckets of water. The fire hit along the dirty shoreline of the Lagos Lagoon, an area full of sawmills that process lumber floated into the city from hundreds of miles (kilometers) away. Massive piles of sawdust and loose shavings fill the area. By Tuesday afternoon, a thick plume of smoke rose from the mills over the city's long Third Mainland Bridge, which links the metropolis to its islands. Read more.